President Bashar Assad’s government came under mounting international pressure Thursday after a chemical attack in northern Syria, with even key ally Russia saying its support is not unconditional. Turkey, meanwhile, said samples from victims of Tuesday’s attack, which killed more than 80 people in the town of Khan Sheikhoun, indicate they were exposed to sarin, a highly toxic nerve agent. Syria rejected the accusations, and Moscow warned against apportioning blame until an investigation has been carried out. 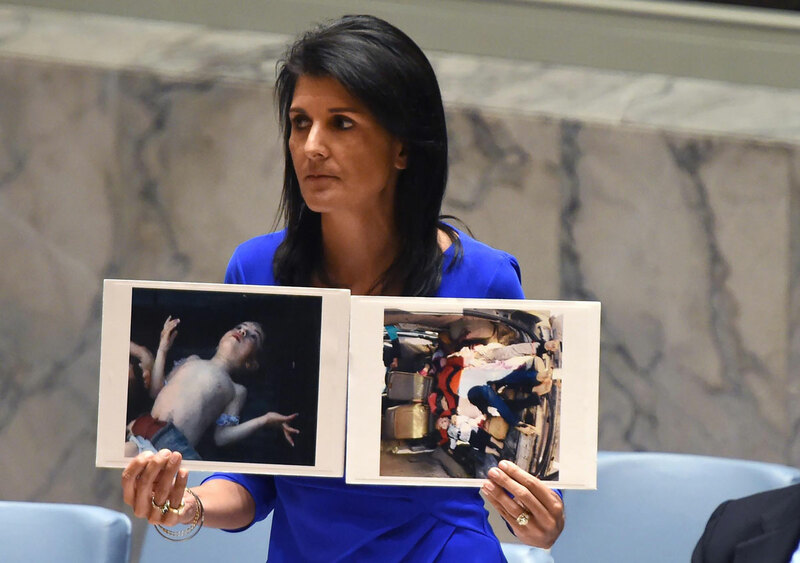 The United States said it hopes for a vote late Thursday on a U.N. Security Council resolution that would condemn the chemical attack. Russia has provided military support for the Syrian government since September 2015, turning the balance of power in Assad’s favor. Moscow has used its veto power at the Security Council on several occasions since the civil war began six years ago to prevent sanctions against Damascus. The two countries “enjoy a relationship of cooperation, of exchange of views and full mutual support,” said Peskov, a spokesman for President Vladimir Putin. Assad and his army are “the only real power in Syria that can resist terrorists on the ground,” he said. Syria maintains it didn’t use chemical weapons, blaming opposition fighters for stockpiling the chemicals. Russia’s Defense Ministry said the toxic agents were released when a Syrian airstrike hit a rebel chemical weapons arsenal and munitions factory on the eastern outskirts of Khan Sheikhoun. “I stress, once again, that the Syrian Arab Army did not and will not use such weapons even against the terrorists who are targeting our people,” Syria’s Foreign Minister Walid Moallem told reporters in Damascus. On Wednesday, his U.N. envoy Nikki Haley strongly hinted some U.S. action was coming if the Security Council doesn’t act. Turkish President Recep Tayyip Erdogan hopes Trump will take military action, Turkey’s state-run Anadolu Agency quoted him as saying. Erdogan said Turkey would be prepared to do “whatever falls on us” to support possible military action, the news agency reported. Russia objected to key provisions in the resolution and negotiations have been underway to try to bridge the differences. A day earlier, Russia had argued against holding Assad’s government responsible. France’s U.N. Ambassador Francois Delattre indicated difficulty in reaching agreement on a resolution. But Delattre told the AP later he thought there was “still a chance” for an agreement with Russia. French Foreign Minister Jean-Marc Ayrault urged a resumption of peace talks and said he wants Assad’s government prosecuted. He told CNews television that a U.N. resolution and peace negotiations should be a top priority – not new military interventions. “France is still seeking to talk with its partners on the Security Council … Russia in particular,” Ayrault said. “These crimes must not remain unpunished. … One day, international justice will rule on Assad,” he added. After the attack, hospitals around Khan Sheikhoun were overwhelmed, and paramedics sent victims to medical facilities across rebel-held areas in northern Syria, as well as to Turkey. The Britain-based Syrian Observatory for Human Rights monitoring group put the death toll at 86. The attack happened in Syria’s Idlib province about 100 kilometers (60 miles) from the Turkish border, and the Turkish government – a close ally of Syria’s rebels – set up a decontamination center at a border crossing in Hatay province, where the victims were treated initially. Turkish officials said nearly 60 victims of the attack were brought to Turkey for treatment and three of them died. Victims showed signs of nerve gas exposure, including suffocation, foaming at the mouth, convulsions, constricted pupils and involuntary defecation, the World Health Organization and Doctors Without Borders said. Paramedics used fire hoses to wash the chemicals from the bodies of victims. Visuals from the scene were reminiscent of a 2013 nerve gas attack on the suburbs of Damascus that left hundreds dead. WHO experts took part in the autopsies in the Turkish city of Adana late Wednesday, Turkish media reported. The Organization for the Prohibition of Chemical Weapons said it has “initiated contact” with Syrian authorities and its Technical Secretariat has been collecting and analyzing information about the allegations. “This is an ongoing investigation,” it said. Russia has warned against fixing blame for the attack until an investigation is completed. At a news conference in Damascus, Moallem echoed that statement, saying the Syrian army bombed a warehouse belonging to al-Qaida’s branch in Syria that contained chemical weapons. He did not say whether the government knew in advance that the warehouse contained chemical weapons. The minister said al-Qaida and the Islamic State group have been bringing chemical weapons from neighboring Iraq. Syria wants guarantees that any investigation would be impartial and not politicized, Moallem said. The area of Khan Sheikhoun is difficult to access, and as more time passes since the attack, it will be increasingly difficult to determine exactly what happened. Egeland also called for 72-hour cease-fires in key fighting zones so aid can get in and to protect hospitals and evacuees who want to leave. Pressure Builds on Syria’s Assad After Chemical Attack. Syria rejected the accusations. United States hopes for a vote on U.N. Security Council resolution.